Snehibhavan is a rurally located home for tribal and dalit girls in the Kottayam district of Kerala. 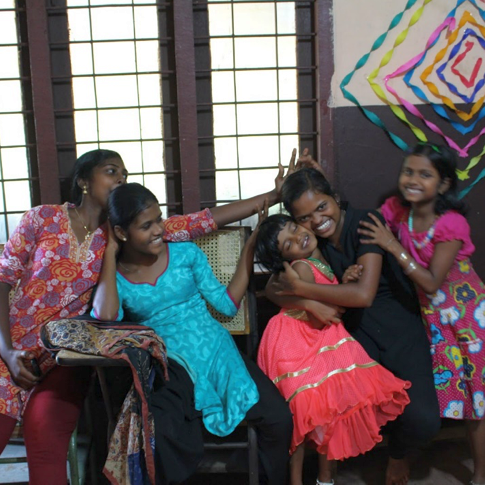 Most of the girls in residence are the children of unwed mothers from colonies in the nearby Idukki District who have been abandoned or found in situations where they were vulnerable to abuse. Snehibhavan is an initiative to protect, look after, educate and empower these girls to face their challenging futures. The director, Sajini, and her husband, Mathews, are dalit activists promoting education and cultural awareness as they work for the rights of the dalit and tribal women and children in their region. Snehibhavan is currently supported primarily by AID Lewisburg. Until the founding of The Jackfruit Project for Snehibhavan by Paula Closson Buck and Keralite Elizabeth Philip in 2007 and the consequent founding of AID Lewisburg, Sajini and Mathews struggled to support the home on Mathews’ laborer’s wages and on local donations of food. Over the past five years, The Jackfruit Project has provided funds for the basic needs of the girls; made major improvements to the facility; provided tutoring, educational support and books; sponsored classes to raise cultural awareness and self-esteem; and assisted the girls in developing and working toward personal, educational and professional goals. A few of the teenage girls have completed training programs in carpentry, medical technology, and computer science, leaving them in a position of empowerment and in possession of choices regarding their futures. A long-range goal of the Project is to eventually help establish a means for the home to become more self-sustaining. The group is also working on adding a new building, enabling the home at last to satisfy the mandatory requirements of Kerala’s Orphanage Control Board for ownership of land and building. Funding for the building is currently being raised locally in Kerala. The annual budget for Snehibhavan’s operating expenses is around $14,000. AID Lewisburg seeks the help of other AID chapters to support that budget for 2013. For more information, please contact Paula Closson Buck <[email protected]>.